The USD/JPY is trading higher today near the 113.10 level. Yesterday the Federal Reserve Chairman Jerome Powell indicated that the U.S. central bank would continue raising benchmark rates due the positive economic outlook but would execute its monetary-policy strategy at a prudent pace. Meanwhile equities are trading positive and treasuries yields hold steady near highs confirming a stronger dollar. 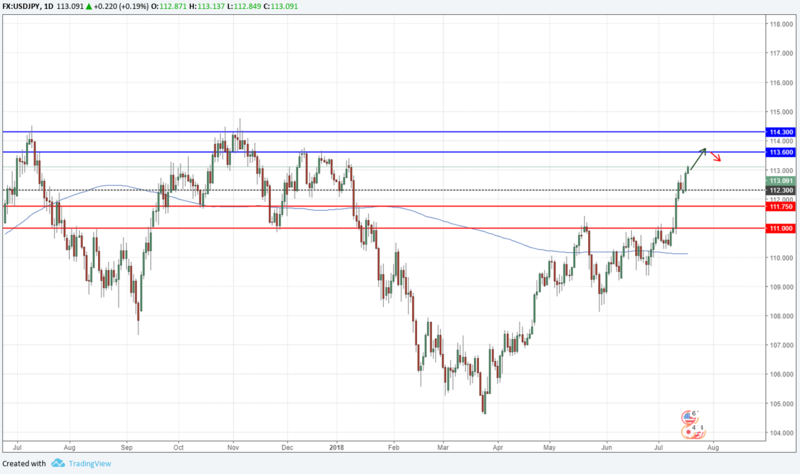 The USD/JPY broke above the 112.85 level and holds onto its gains trading near yearly highs at 113.13. The pair still showing strength for the third week of the month and the next target is 113.60. A break above the 113.60 will lead towards 114.30, on the other hand pullbacks should remain above 112.30 to keep the positive tone.